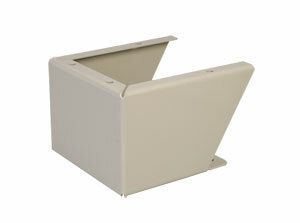 Leg kits can be installed on most wall mounted enclosures with a width of 20" or more. They can also be installed on SCE free standing enclosures. Kits include two stands made from carbon steel and finished with ANSI-61 high solids re-coatable ANSI-61 gray powder coat. Stainless Steel parts are made from Stainless Steel Type 304 with #4 brushed finish. The “SS6” models are made from 316 Stainless Steel with a #4 brushed finish.